Trying to think about what to bring for a potluck, picnic or party? Throwing a Hawaiian Themed Party or Luau? This is healthy fresh fruit, in an attractive display - that is fairly inexpensive, but effective. It is very easy to put together, and is guaranteed to impress. Your friends and family will be complimenting this one! CHEAP - EASY - IMPRESSIVE! This platter is exactly what you want for a party or potluck. It works great on a buffet or as an appetizer plate. This platter goes great at any party - it does not need to Hawaiian themed. I have brought this to many potlucks at work and church. Everyone loves it! What Do I need to buy and what do I do to make this fruit display? Shopping list #1 is a MUST HAVE for this display. 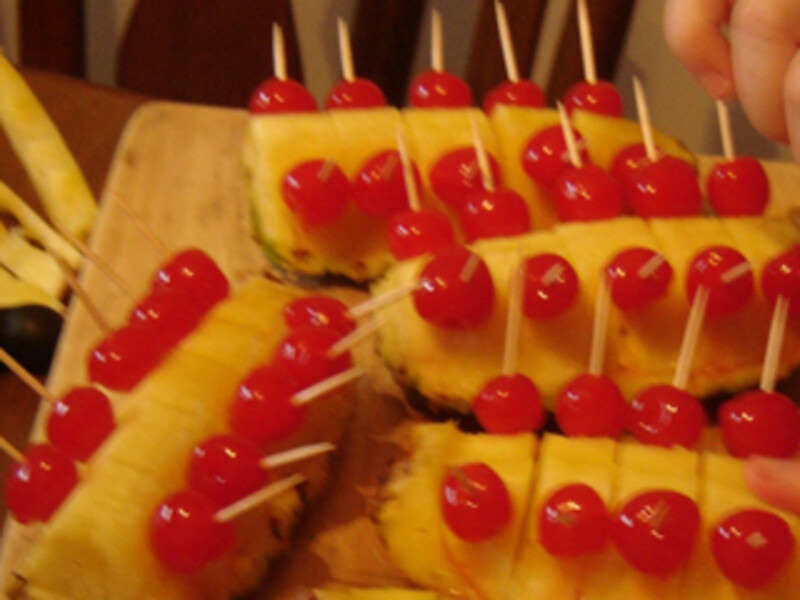 Shopping list #2 is a list of SUGGESTED FILLERS to fill in the sections between the pineapple. The fruits you use in the sections between the pineapple and cherries can vary depending on season, taste, and budget. These sections of the platter are referred to as the "filler" sections. Suggested combos are also below in another section to help give you ideas of what to mix and match. 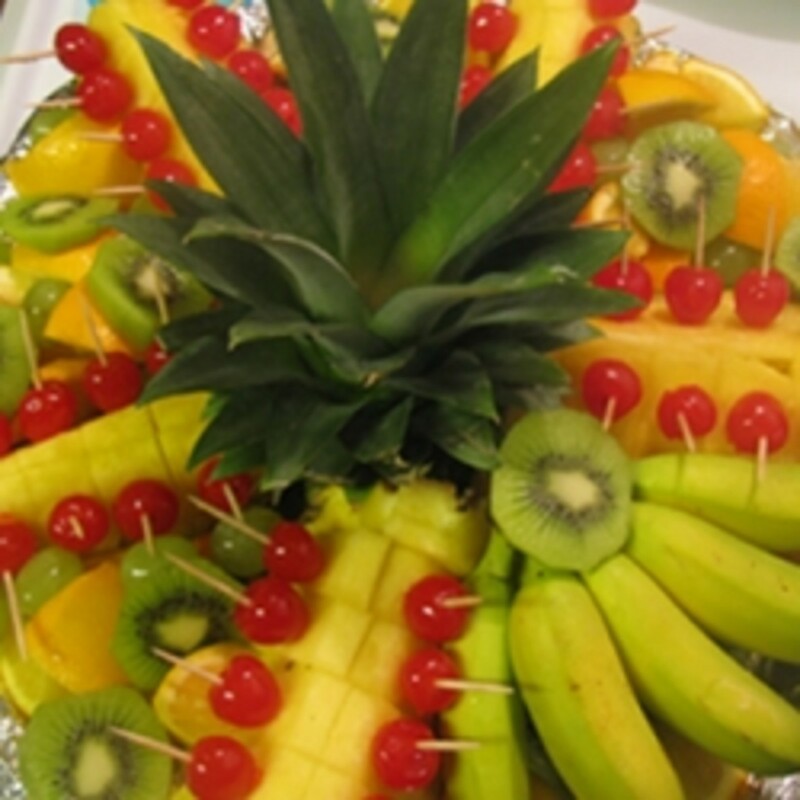 There are also tips for how to prepare the various fruits as well as how to assemble the tray. There are most likely way more info here than you need, but this page makes this tray dummy proof. Shopping List - Part 1 - The items you NEED to purchase. These are the MUST HAVE's for this fruit display. You will want to get all of these, plus a few from the "shopping list - part 2" but those are a bit more flexible. You will have a nicely full fruit platter if you get everything in shopping list #1 and pick a few from this list to fill in. TIP: look for contrasting colors and shapes (see below for suggested combos). Any other fruits you want to add it. Look and see what is in season or on sale. This is the part that sets this platter apart from others. This looks a bit complicated but it is VERY EASY! Simply follow the steps below. It is really NOT COMPLICATED - I just wrote a lot to give give you as much help as possible. If you are handy at all in the kitchen, you can likely breeze through this. Click the images to enlarge them. Shop - clearly the center of attention for this display! You want to pick a well shaped one - especially one with a nice looking stem. 1. CUT THE TOP OFF THE PINEAPPLE ABOUT 1 INCH BELOW THE STEM. I find that a bread knife is the best to use for this. This is the knife I use. It works great on a pineapple! What kind of knife should I use to cut the pineapple? You will want to use a good bread knife - again, something you should have anyway. You could try a different type of knife, but it will probably take a bit more effort than a bread knife. SET THE TOP IN THE MIDDLE OF YOUR PLATTER WITH THE STEM AIMING UPWARD and check straightness. If it does not sit straight up, trim the bottom so it is flat and the stem stands straight. Leave the stem in the middle of platter. 3. 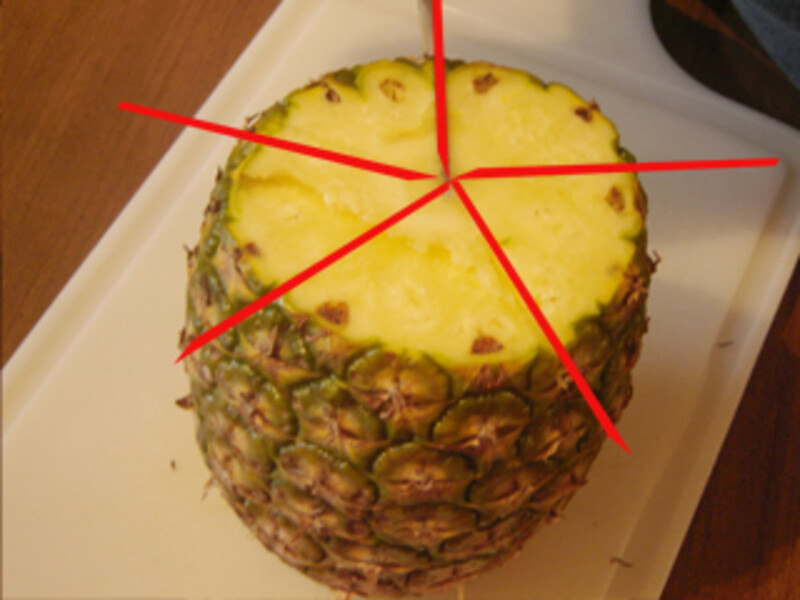 LOCATE THE MIDDLE OF THE PINEAPPLE CORE. 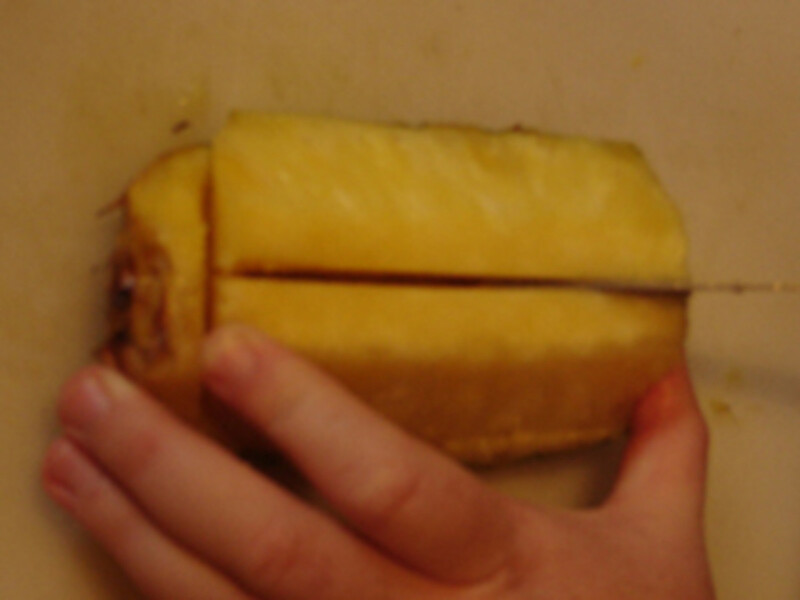 Before cutting, note the circle that runs through the middle of the pineapple -this is the core. 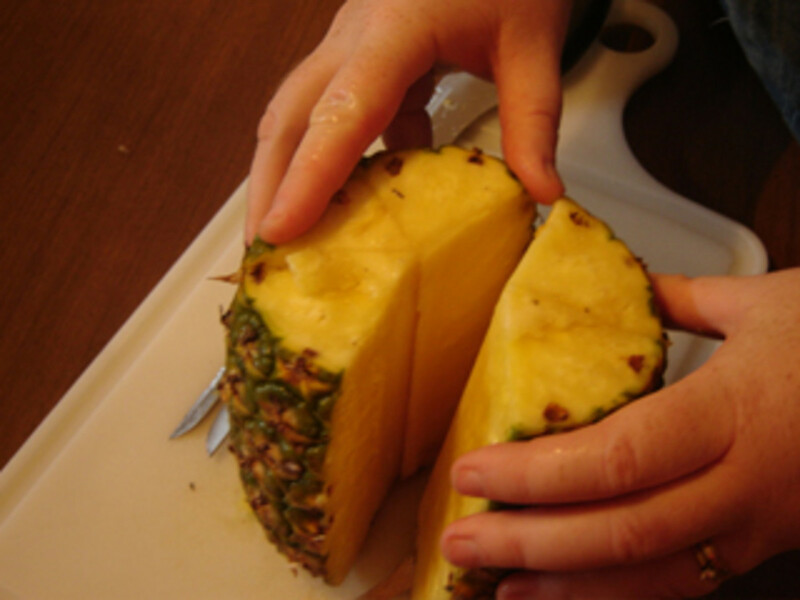 It tends to be more firm than other sections of the pineapple and less desirable to eat. 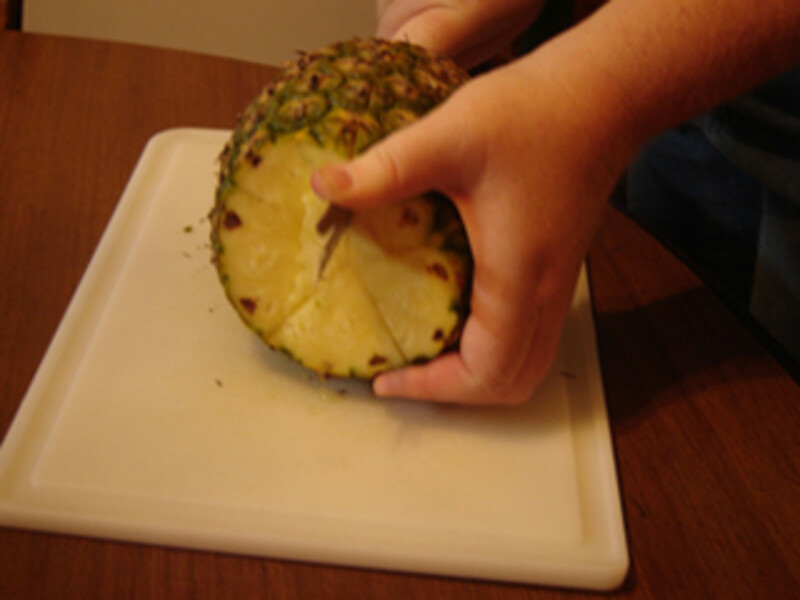 It will ultimately need to be removed, but it is easiest to do after the pineapple is cut into sections. Mark the middle of the core with a dot for reference with a knife or other tool. Take each section and slice a small amount (about 1/4 inch) off the pointed part of the cut. Remember how big that core was when looking down from the top. The new sections have 1/5 of that core at it's point. Take your sharp knife, and glide down the point to remove the core and discard. The sections should now have a flat top and the rind still on the bottom. 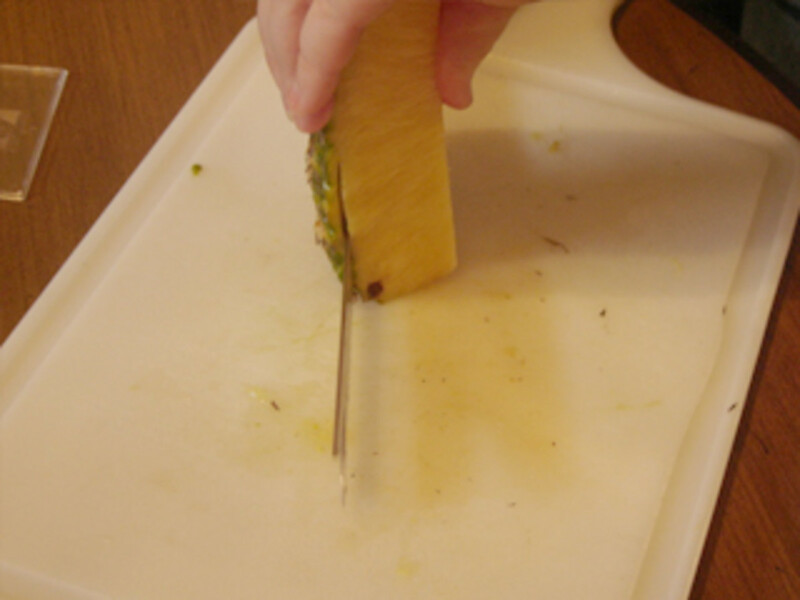 Lay down one section of pineapple on a cutting board. 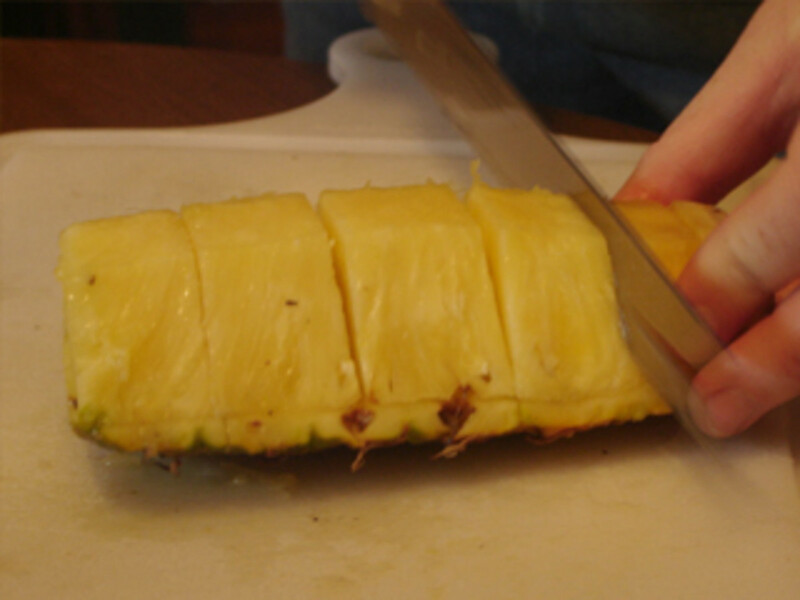 Start your cutting at the bottom end (what used to be the bottom of the pineapple). Cut downward just below the rind where fruit starts, and go down following the fruit. 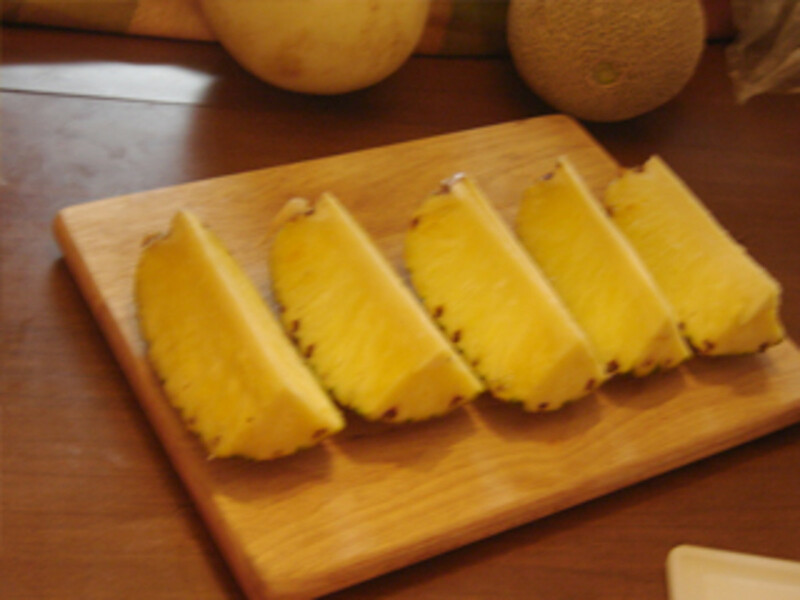 Turning as the pineapple turns, so that you are simply separating the fruit from the rind. The aim is for the fruit to remain in one piece and the rind to also remain in one piece. I often go down one side and up the other so that I encircle the full section, this way I get one piece. Repeat this for each of the 5 sections, storing the fruit directly on the rind as you cut it. 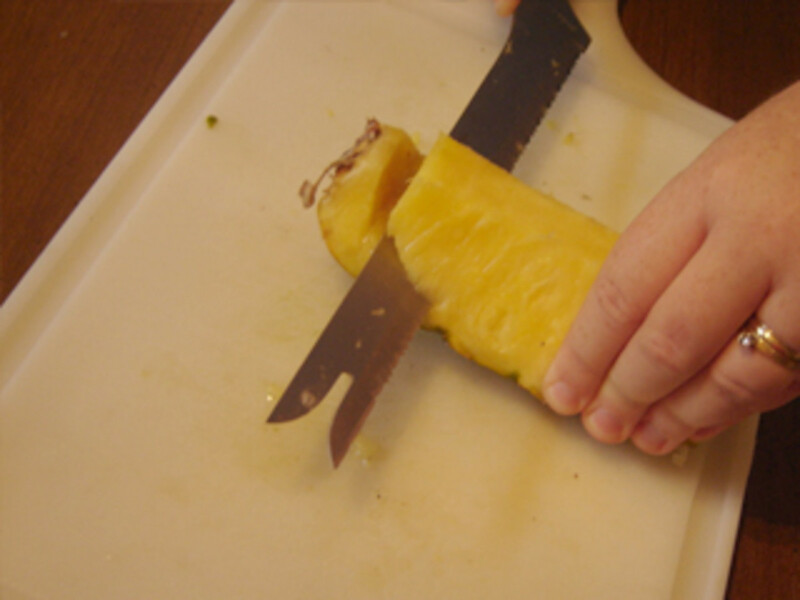 Simply separate the rind from fruit, but do not remove it. The rind will now serve as a display for the fruit, and keeping it on the rind will keep the shape and looking good. I suggest keeping the fruit on top of the rind during cutting, as it is difficult to put it back together if you remove from the rind (but can be done, just makes for a bit of puzzle putting together ...) Cutting into the bite sized pieces is done fairly simply with one slice down the middle of the section of fruit along the flat section that was formed during the removal of the core. Cut down the fruit, but not through the rind. 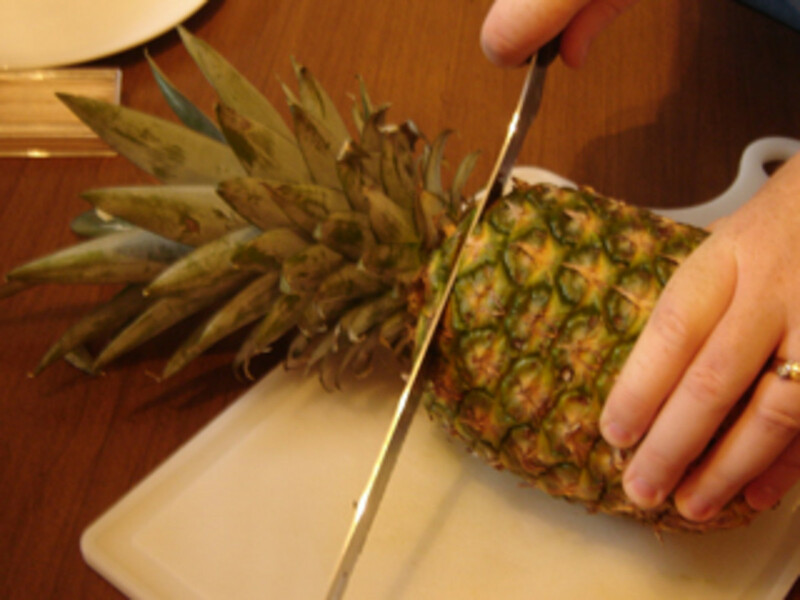 Now turn the pineapple so that you are cutting in the opposite direction from that cut to form the bite sized pieces. 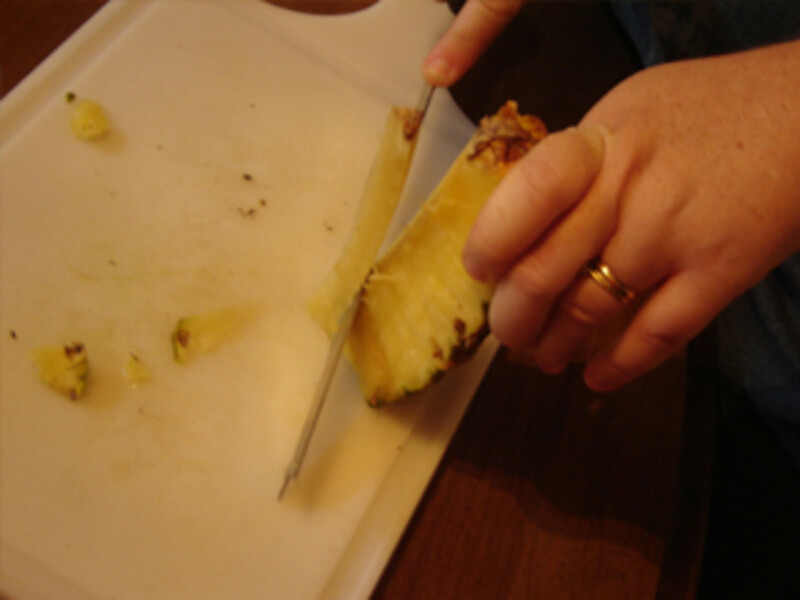 Cut these sideways cuts 4 times down each section - totaling 10 pieces of pineapple per section once this cutting is done. This tops off the showpiece. After you've done the initial Pineapple Preparation, it's time to add the cherries. You will need at least 50 good ones, so I suggest getting two jars. You may have a little waste but one jar usually doesn't have 50 and certainly not 50 good ones. Open jar, place 2 fingers over cherries and turn over to dump liquid out leaving cherries in jar. You may want to save half a jar of liquid in case you have leftover cherries for storage, but you likely wont need all the liquid. You can do one jar at a time so you have less to deal with on the dish. When they are on the dish, you can see them and work with them easier than directly out of the jar. INSERT TOOTHPICK INTO CHERRY. Use just the good looking ones. 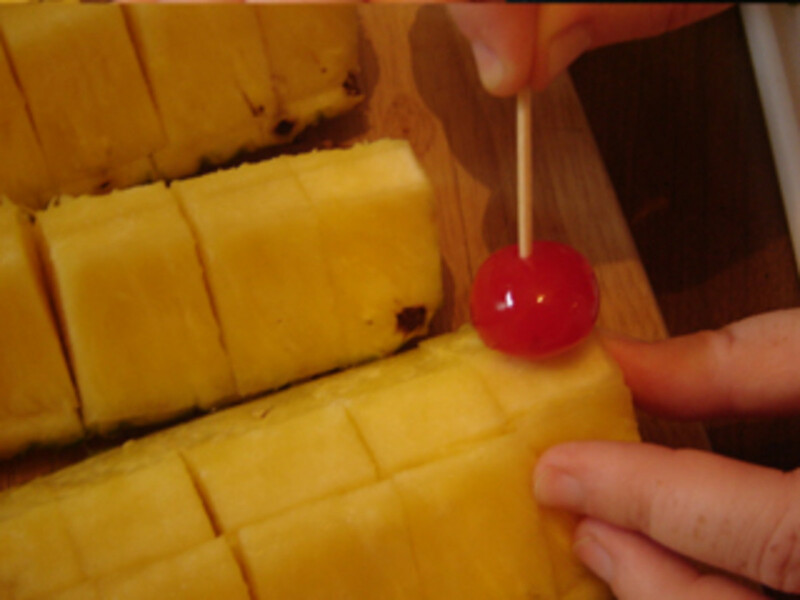 Place cherry on top of one of the pineapple bite sized pieces (still sitting atop the rind), and push the toothpick through to hold it on. 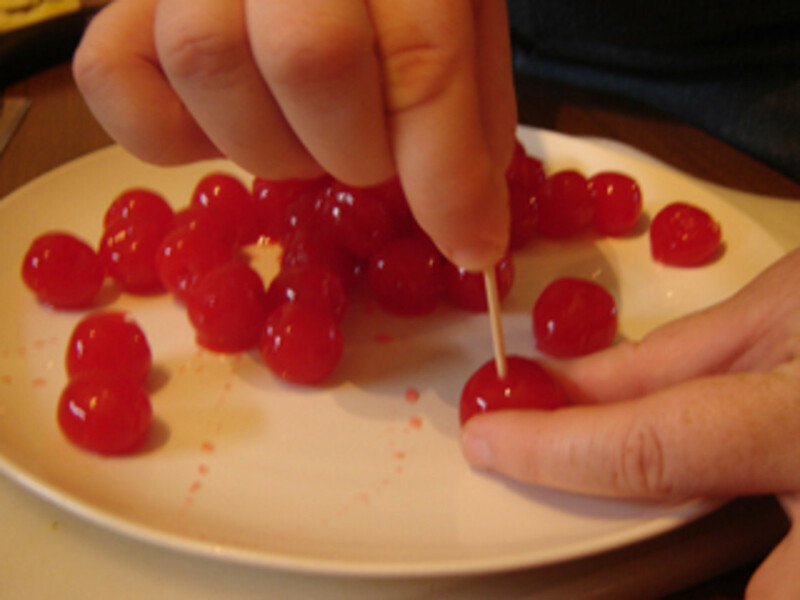 Use two hands - one to stabilize the cherry in desired location, and the other to push in the toothpick, making sure to leave enough toothpick out for guests to hold and lift the pineapple and cherry. You're going to need two or three of these fruits. Keep it simple. 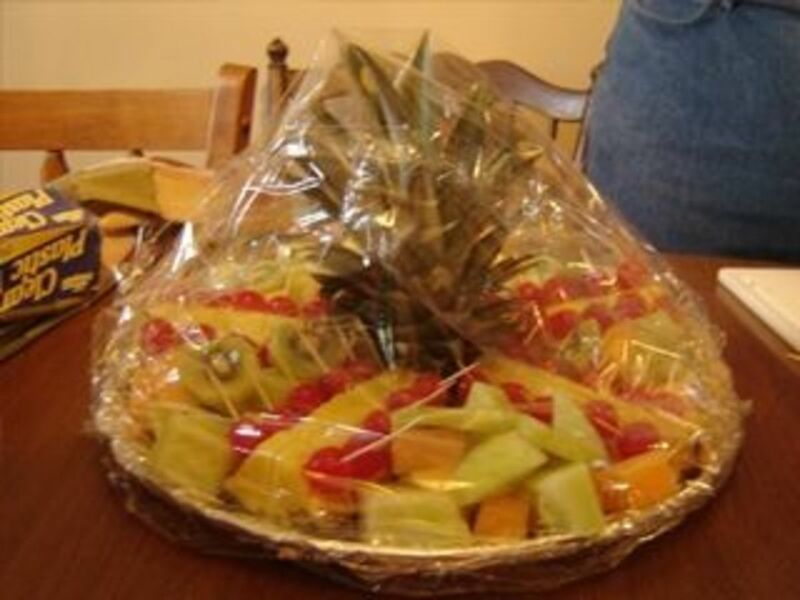 Here is some info for shopping for the fruit, as well as how to prepare it for this platter. Chop - Clip them into small clusters of 4-6 in a bunch, so people can get a few easily and they don't roll around. Shop - Fairly inexpensive but full on platter. One goes a long way. Nice orange color - works great with the Honeydew melon. I would not use Cantaloupe and Oranges due to similar color - go for color variety. Chop - Be sure to cut into similarly size and shaped pieces if you can. Usually just regularly cubed cantaloupe (approx 1 - 1.5 inch squares) works great in this platter. Chop - Cut in uniform pieces if possible for the best presentation. Usually served in cubes about 1 inch in size. Shop - one of those smaller watermelons (cantaloupe sized) works great for cutting and fitting on platter, and usually provides less leftover fruit - but you can also use just part of a full size one you might already have or save the rest for another occasion. Chop - I usually suggest cutting into cubes such as with the other melons. The as with cantaloupe, the rinds are nice accent in other platters, but with all the pineapple cherry stuff in this one, the color and texture from rinds are not needed, and are actually overkill. Shop - you don't need many, but if going for a multi-colored fruit platter, it does give a different color. I would use sparingly though due to the round shape as they compete with the cherries. Would also avoid choosing these if using grapes for same reason - simply too many circles. Blueberries may be nice with the Cantaloupe and Honeydew melons for a darker contrast color and to break up all those melon squares, but may not be needed if using accent fruit like kiwi or star fruit. Shop - they are more expensive than other fruits, and less familiar, so people likely won't eat as much - unless they're a curious bunch, but they do make for a nice display. One should be plenty for nearly any platter. Shop - These can add another inexpensive bulk fruit, but are less colorful, so don't go overboard here. They do break up a punch of color though if using bold colors like those offered by many berries. 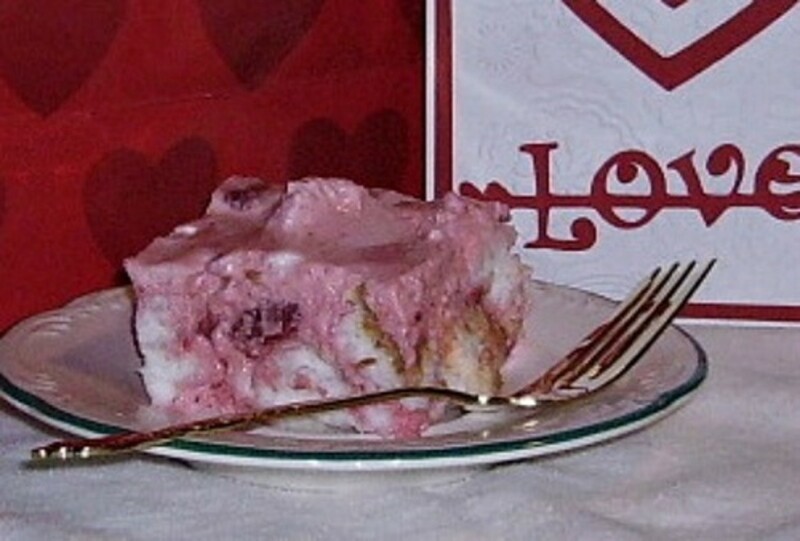 Would be nice option with strawberry and blueberry mixture. Shop - I suggest chunking these by slicing them into one inch chunks. I suggest doing this last minute to avoid browning. Another alternative to these are the mini-bananas - see below - Both are usually liked by guests. Shop - Get a nice looking bunch of mini bananas - the little ones - they are usually right near the regular ones in your grocery store. Make sure they will be ripe on the day of presentation - they ripen in same time as regular ones. Shop - I would get only one box of them. Look for nicely shaped ones, not too big. Decide if using for bulk as a main fruit or more sparingly as an accent. I prefer these as an accent due to the unique shape as well as its red color - as so much red is in the cherries, you don't want to compete with the cherries. Chop - Usually served cleaned but whole, can also be sliced in half and displayed with flat side down to make them go farther. Shop - Green or Red can be effective. Can get both and mix if you want. Yellow ones usually are also too pale with the pineapple - Get nicely colored apples. Chop - I suggest washing but leaving the peels on for color ! They look too pale without the peels. Cut them into 8 slices per apple, and be sure to remove the core and seeds. Chop - prepare as you would for any other fruit platter - I usually suggest leaving peels on for added color, texture and effect. These are pretty fruits that add a beautiful look to your platter. Sometimes more expensive, they can all be used in small amounts as a little goes a long way. You only need to pick 1 or 2 of these. You don't want to have too much going on. KIWI - Some people leave the skin on these and just slice. I prefer peeling them and slicing them so that the guest does not have to complete the preparation at the table. These are pretty and are best displayed if the last thing put onto the platter. I consider these an accent fruit. Shop - you can add more if you like, but 2 is usually enough - they really do make a difference in the presentation, so I wouldn't leave out even if you get only one. Chop - cut in rounds thick enough to not be floppy. Skin on or off - your choice. STAR FRUIT - Similar to Kiwi, these should be cut thin, but do not peel. It is nearly impossible to peel these things. The skin keeps their shape. They are beautiful, yet less colorful, so choose only if you have plenty of other color. BLUEBERRIES - These can just be scattered across the tops of the filler sections. 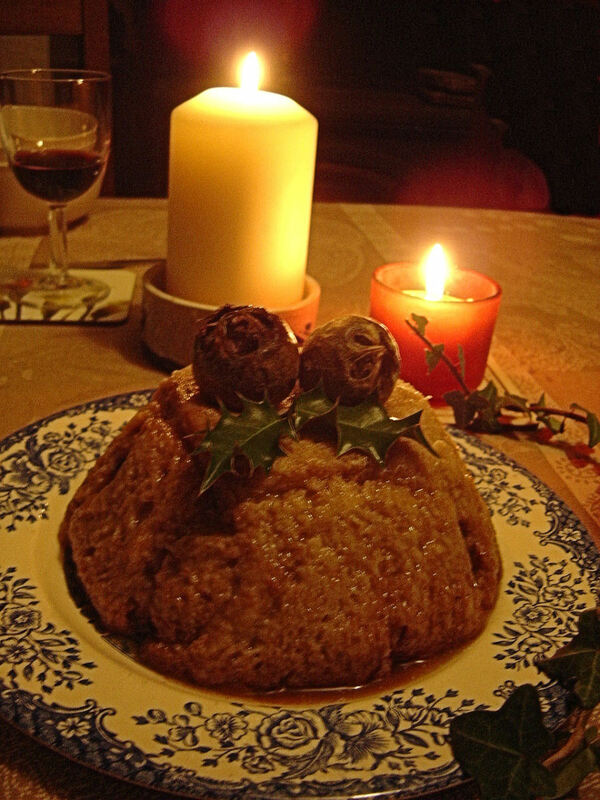 Again, a few go a long way with presentation. What Size Platter does this fit? - How big is this fruit platter? Ideally, you want a platter that is approx.14 inches round. This is the size that I use, and it ALWAYS fills perfectly with the size of the pineapple center and slices. I have done it on 12 inch and 16 inch, and it does work, but it does not end up quite as perfect. So, if you are going for perfection - go for 14" round. Why not, if your going to the effort to make a nice platter, why not make it perfect. TIP - I usually cover it with tin foil, so it really doesn't matter what it looks like, but when I have a pretty platter, I leave it off. If your platter is "busy" patterned, I would suggest using the foil ... if it is plain color or clear, you can leave it off. It is also fairly inexpensive and shipped for free from Amazon.com. cut and paste the search - "two lumps of sugar 14 inch Round Platter", click the link and enter that to see them all. They are a great size to have available in your kitchen anyway - so treat yourself to one. You will be happy you did! Everyone should have a decent platter in the cabinet, for this display, and for any potluck or party. You might even use it for dinner with the family or BBQ etc. Click on my links and I will LOVE You !!!! (some are rather inexpensive) - and most shipped for free. Thse are the manual assembly directions, to be completed after fruit is prepared. Place the Pineapple stem in the center of the Tray. 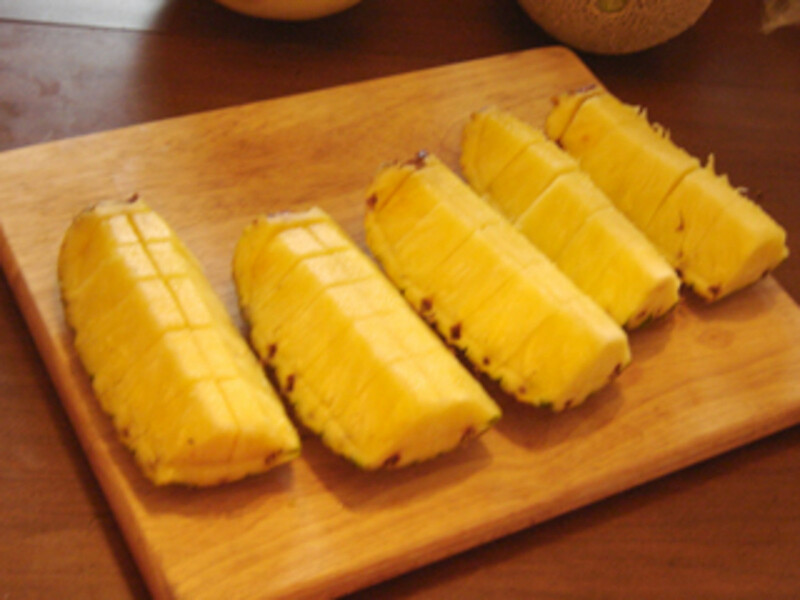 Place the 5 pineapple sections (with cherries attached and sitting on the rinds) on the tray. The bottom edges (what used to be the bottom of the pineapple) in towards the stem. Arrange your assorted fruits (the bulk fruits for the filler sections) - should be 2 or 3 varieties - in the sections in between the pineapple/cherry/rind sections. (see tips section and suggested combo section for ideas and specifics) -- TIP -Use one section for the mini-bananas with only a few of the other fruits if using mini-bananas-see pic at top of this page. Add accents to top the filler sections - sparingly for nice effect. Cover with plastic wrap or foil and chill until serving time. ENJOY !!! 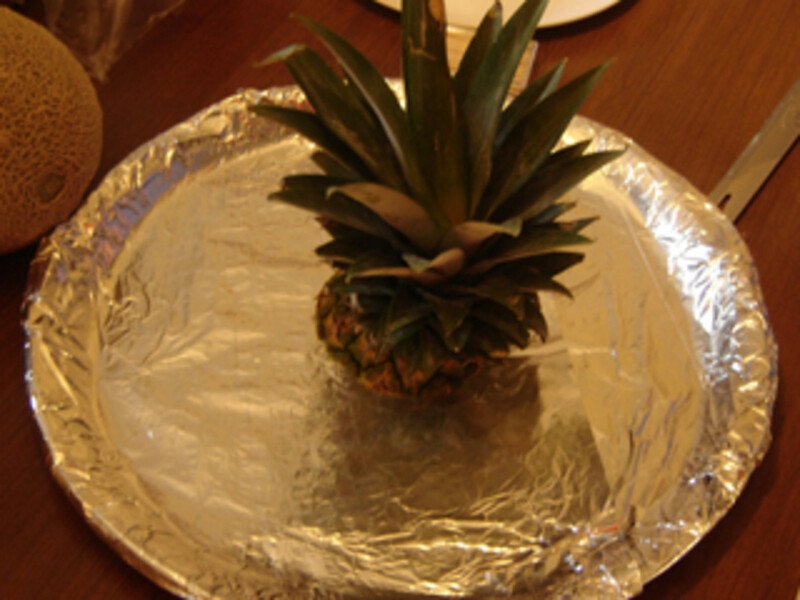 Lay out the pineapple top and the prepared pieces around it. If you don't like maraschino cherries - you can substitute for purple/red grapes. The green ones could also be used, but they against the yellow pineapple, they're not as vibrant. Be sure that any grapes you are using don't have seeds - you don't want them to have to spit out seeds at the party. If you do opt to change out the cherries for grapes, you may want to add some strawberries for the red color that packs a punch in this platter. I personally, like the cherries - and they taste great with the pineapples - but I do realize that some people do not like the sweetened fruit. 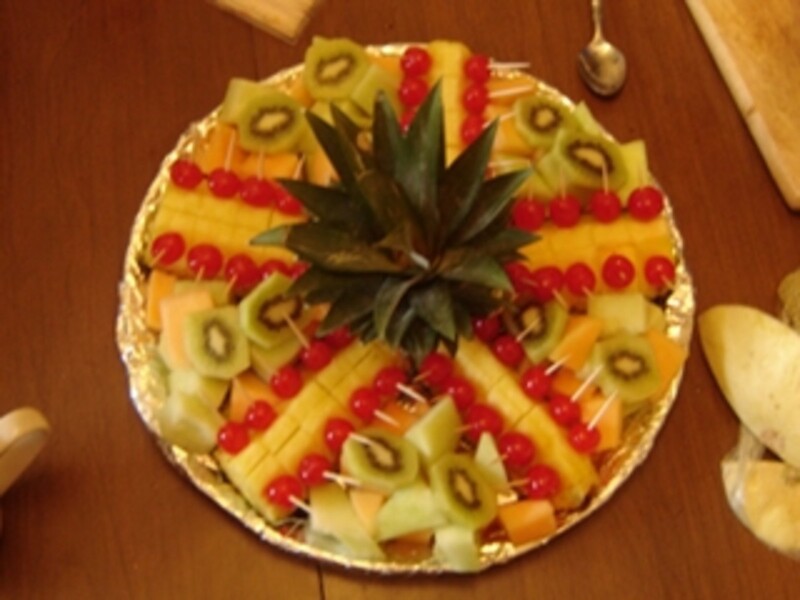 You are going to want to bring the rest of the box of toothpicks and have them accessible for guests - If not, the middle fruit will not go as fast as the pineapple. 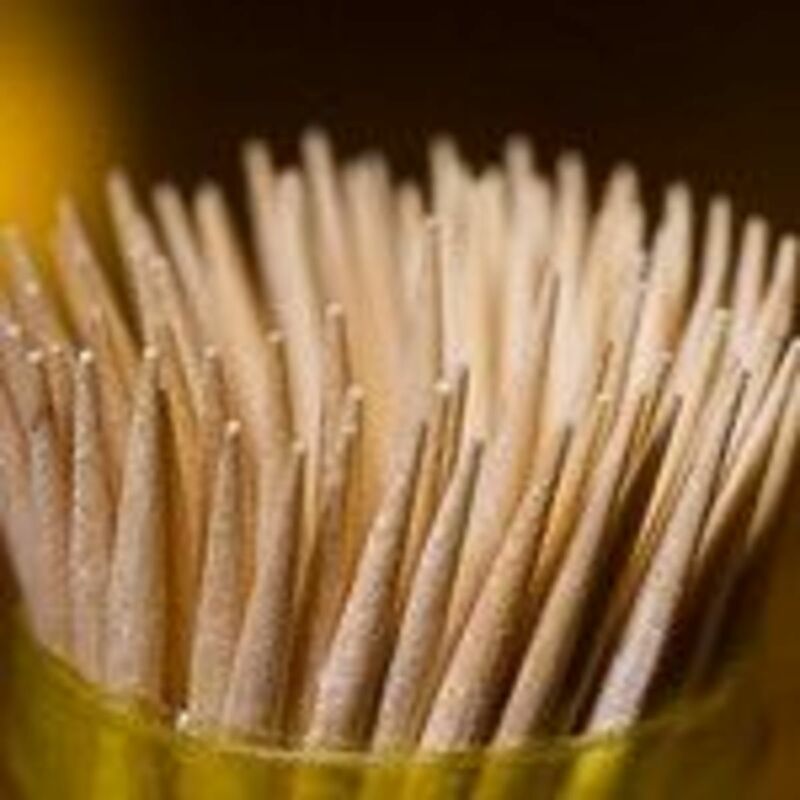 Also, if you bring a dip the toothpicks are handy for guests to use when dipping. 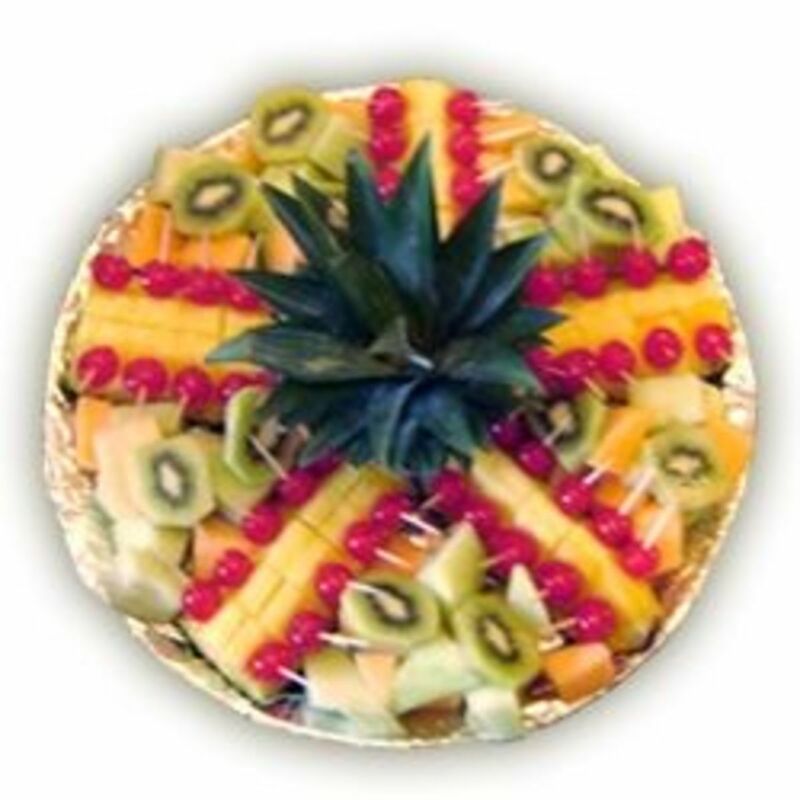 This is a beautiful fruit platter to display at a Thanksgiving Gathering, or at a Holiday Celebration. People are often asked to bring something, or want to bring something to a holiday event, why not bring this impressive fruit platter? 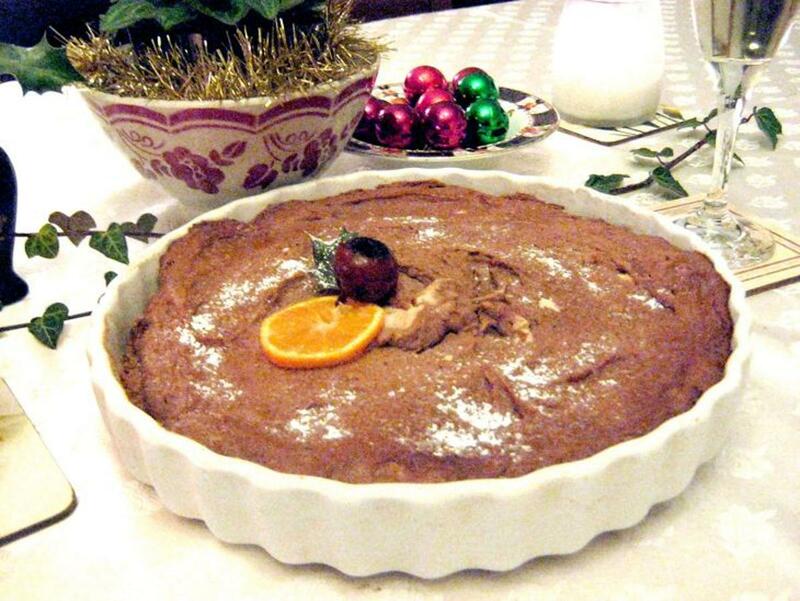 Looking for fruit or food for any of these holiday gatherings? Do You Think You Would Ever Make This Fruit Platter? By the look of it - Do you think you would ever make this fruit platter? Yes - I sure will! It looks great (and easy). Maybe I will try it sometime. It looks doable. Naw - It looks too complicated! Nope - It looks like nothing I would like at my party. Fruit platter with many fruits. A bit on the 2 dimensional side, though. Recipe from: "Easiest Ever Holiday Meals--Cooking Magazine"
This is a nice platter. It uses the bottom of a pineapple as a bowl for other fruit - or maybe you could put a fruit dip there. Some people like to serve a dip with fruit platters - these are 2 similar dips that goes well for Hawaiian Fruit ! Both start with different base dip, and then you add the Hawaiian elements. -Wisk 1 1/4 cup of MILK with a box of VANILLA INSTANT PUDDING (regular size box 3-4 oz) till nearly pudding like consistency. -Then add in 1/2 cup of SOUR CREAM and mix well. Continue with these steps after following one of the above sets of initial steps to complete one of the dips! This list is used to finish out either of the dips. OPTIONAL : Can add a little of any of your other fruits from platter as well - puree before adding. OPTIONAL : Can add a little red food coloring or some of that left over Cherry Liquid to make a nice pink color if desired, but white also looks nice with the colorful fruit platter. 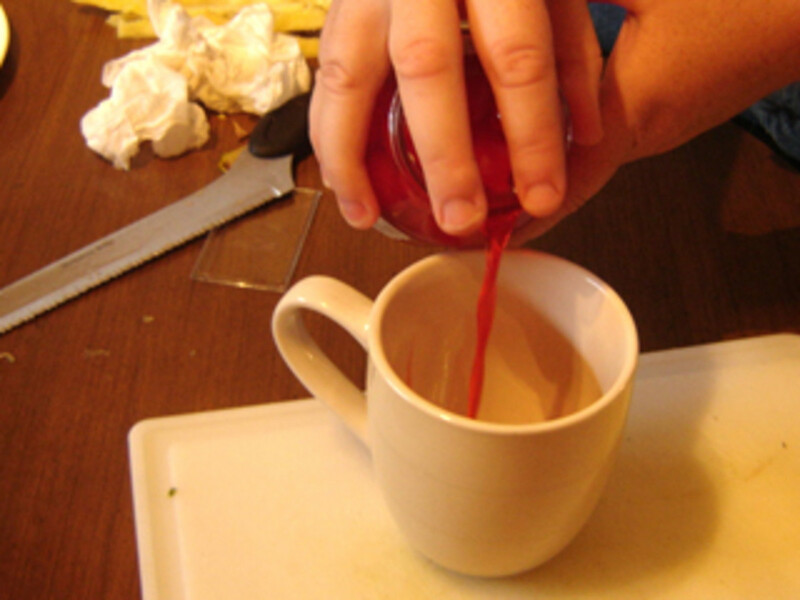 - THIS IS A WAY TO USE SOME OF THAT LEFT OVER CHERRY LIQUID ! - WILL GIVE THE PINK COLOR, AND A LITTLE TASTE TOO ! - YUM ! If you make one and are proud - do share a pic with me at BECHAND@aol.com. I can add it here so everyone can see YOUR handy work ! A great selection of games for Kids or Adults - for Hawaiian Parties. I love your Hawaiian Fruit Platter. Your lens is very informative and creative. This sounds like a good idea. I love fruit platters at all my parties. I will try this for a party! Thanks for all the details and creativity! Wow, this is really a great idea for fruit platter. A great lens!! awesome! Hawaiian meals just got better. What a wonderful lens. I love all of the attention to detail and the photos and step by steps are amazing. I also love Hawaii and tropical fruit. Great lens! I squid-liked this lens on a previous occasion. I returned to BLESS it today! @Heidi Vincent: That is the one that I made, and the one the page gives directions for - the others were just shown as other choices - glad you liked it - give it a try sometime. Great fruit platters. The one in the intro is especially lovely. This platter looks amazing. I wish I had read it earlier because I am going to a birthday party tonight and this would be perfect. I will definitely do this in the future! 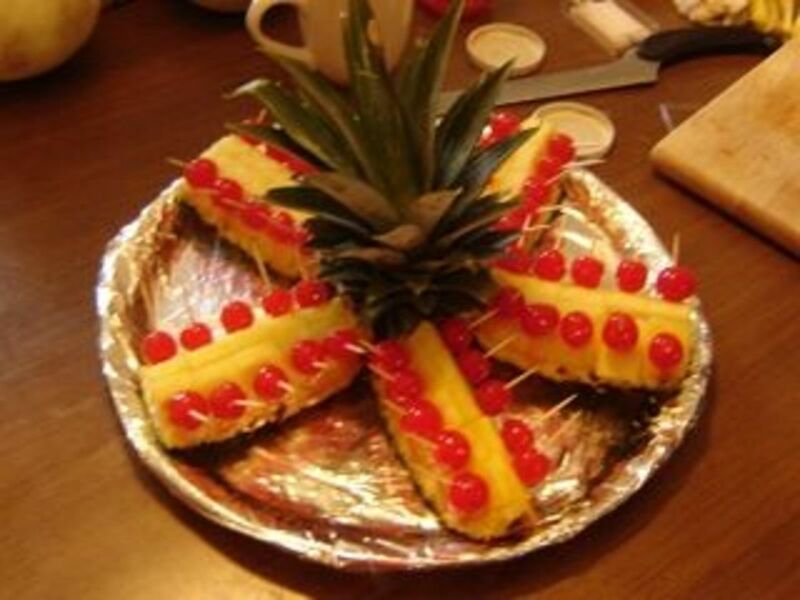 Love your instructions on how to make a Hawaiian Fruit Platter! Excellent page! 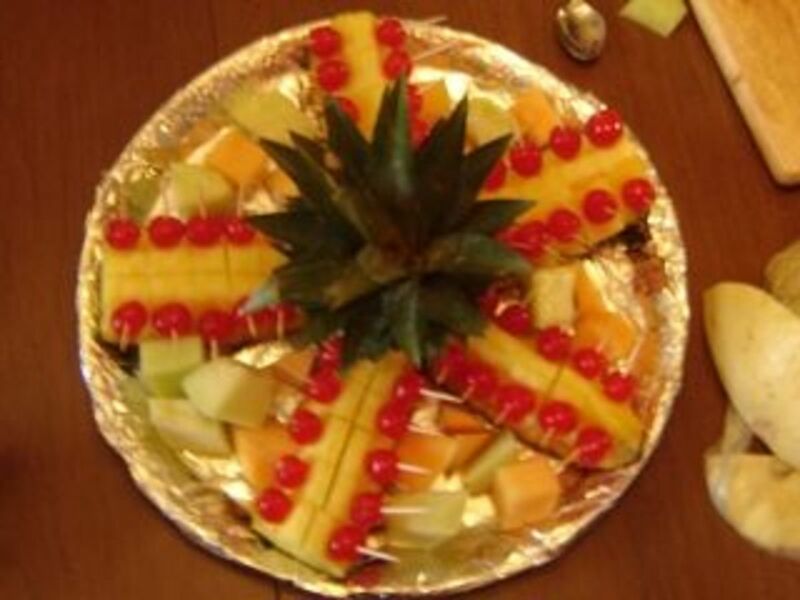 We go to a lot of church potlucks, and this is great inspiration for a different twist on the usual fruit platters. mmmm, you are making me hungry. You have done an awesome job in putting this page together. Well done, I especially love all the photos throughout the steps. I had to "pin" this because I know there will come a time in the future when I will need to make this platter. Excellent how to! God fruit is so good isn't it? I dream of being able to visit Hawaii and taste all these amazing fruits in a smoothie! What a fun, colorful, and tasty addition to a party! Thanks so much for sharing - blessed by a SquidAngel! Oh my gosh! I will definitely be making one of these! What great ideas! WOW your lens is totally refreshing and beautifully creative. Thumbs up!! Thanks for your wonderful lens and information. 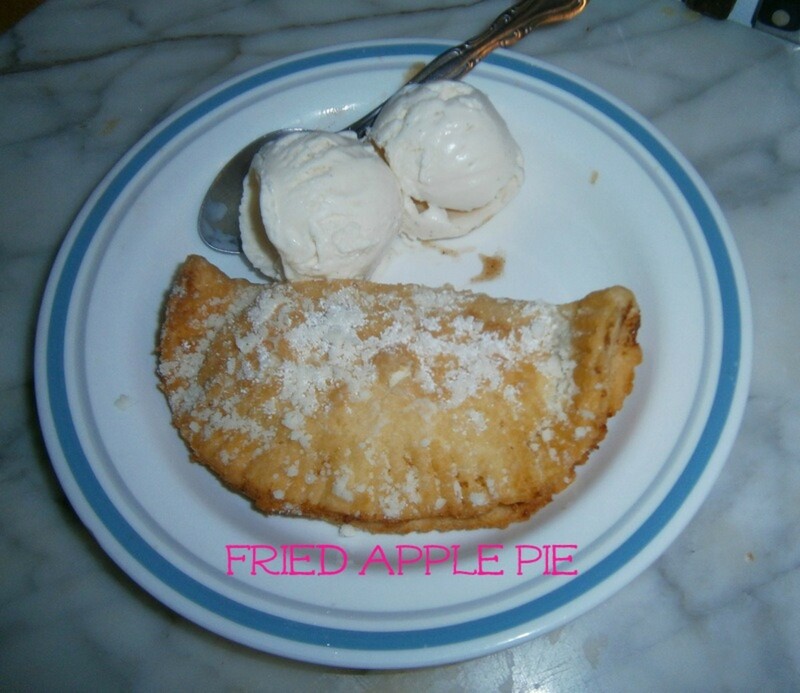 This really looks yummy and easy to make. I will have to make this the next time I bring a fruit plate to a pot-luck dinner. This is perfect for these hot, triple-digit summer days. Nice lens. Beautiful lens of fresh fruit. Great lens, loved the recipes, fresh fruit is great. Love anything Hawaiian. "Liked" your lens too! Great way to showcase my favorite fruit - terrific lens. Great lens and glad to meet you too! I think this lens may be the first and not the last time our paths cross. Blessed by COUNTRYLUTHIER. Such a wonderful lens, and the ideas are very inexpensive. A wonderful way to make a gorgeous and inviting fruit platter for entertaining, and terrific step-by-step instructions with great photos. Blessed! 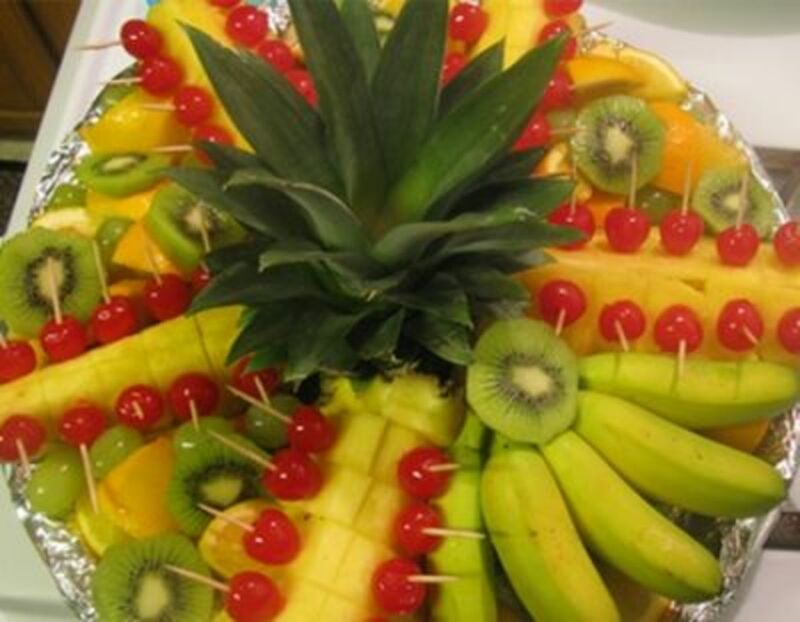 My mom is going to have a Hawaiian theme for her retirement party in less than 2 years and this Hawaiian fruit platter and other ideas on here look great. Might give it a try! The pictures do speak a thousand words!!! Everything looks delish. Thanks for putting it together. Beautiful! Looks so appetizing! Great lens! Great instructional lens. It looks so good. Beautiful, informative and well done. This looks wonderful! A lot of good information here. So many great ideas...pictures are great! Yum! I love fruit. This is a very attractive display with great instructions! Blessed! You certainly do have everything involved with creating a Hawaiian fruit platter covered in this article. Great article. Awesome collection and what a way to describe the details. Really great. This is a wonderful lens, and all your detailed instructions and pictures inspire me to create one myself. Gorgeous platter of fruit and I loved the design of this lens. Well thought out. I enjoy making new creations with fruit. Thanks for the lesson. Very beautiful platter. Thanks for sharing such detailed instructions for assembling the platter, and recipes for the dips to serve with it. Blessed. 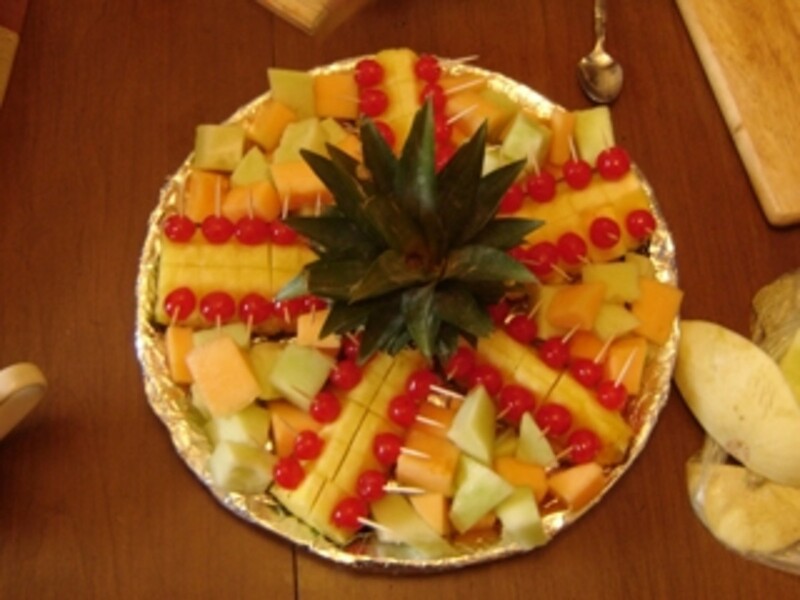 This is an attractive and healthy way to put a fruit plate together, and I like using the top of the pineapple in the center of the plate. Well done. Nicely done, easy to follow instructions and clear pictures. Thanks for sharing this idea! wow! great tips...will definitely put in to practice on the next coming party. Great lens and excellent instructions! Thanks! So beautiful! Looks so incredibly yummy! I may have to do this for my son's birthday party this July! Thanks for this great lens! I like this platter! I could really do this for potluck. Beautiful, makes me wish I had a party to take one to. Hey I love your fruit tray! Looks healthy and delicious. Wow! A truly incredible lens! I've always wished I could prepare a platter of this type, but considered it far above my culinary skills. Now I have this beautiful guide! Angel Blessed! What a beautiful lens. Even the security word is "superyum"! What a beautiful article and so well done with pictures and steps. Blessed! 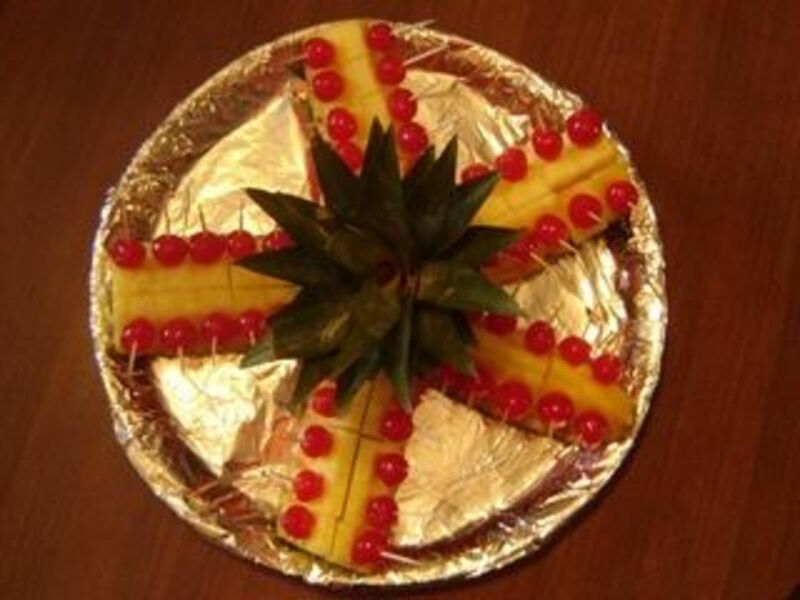 Just had to come over to congratulate you on front page honors for this mouth watering Hawaiian fruit delight! This is great! I think I will bring this to our next senior potluck. Everyone brings greasy rich food and no one can eat it! Beautiful lens-- Great idea for this summer, and I appreciate the step-by-step instructions so just about anyone can do it. Congratulations on your purple star. Blessed. Vibrant and delicious fruit platters. I'm going to try the dip recipes, thank you. Nice lens! Interesting idea, although I would use fresh fruit exclusively. Colorful and easy! Thanks for sharing. Very beautiful arrangements....and they look SO tasty. Beautiful fruit platter. I love it and would make it for a party or potluck too. What a wonderful lens! I'm surely going to give this a try at my next party! And thanks so much for featuring my Luau Birthday party lens. Great lens with soooo much interesting information. This is impressive - both the platter and the detail in your lens - thanks for sharing! Terrific photos. Your fruit platters are beautiful. I love the way you explained how to put it all together. Wow, these are gorgeous! And I bet I could trick anyone into thinking I actually know something about cooking!